Everton slipped 5 points below 4th Place at the weekend in 6th place after a harsh defeat at White Hart Lane. Emmanuel Adebayor latched onto a momentary lapse from Everton's defence to seal the only goal of the game despite Everton having the better of the game. It was another game that went by without a clean sheet making it 4 games in a row without keeping the opposition out. Only Stoke (9), CArdiff (9), Aston Villa (5) and Aston Villa (5) are on a worse run. Only 4 teams have fallen behind on fewer occasions than Everton this season but only Chelsea have gained more points from those teams. The team Everton play at the weekend are amongst the worst in the league having gained just one point from 16 losing positions. Crystal Palace's single point came in a 1-1 home draw to Norwich. Everton came from behind to beat West Ham 3-2 Away from home and Aston Villa 2-1 in their last match at Goodison Park. Everton took a point from Norwich away, Arsenal away, Stoke away and and Liverpool at home after being in losing positions. Crystal Palace picked up their 3rd home win in a row at the weekend as they outplayed West Brom in a 3-1 victory. New signings Thomas Ince and Joe Ledley got on the score-sheet whilst Scott Dann put in a good performance at the back. Those 3 home wins coincide with 3 straight defeats on the road with defeats to Manchester City, Tottenham and Arsenal despite positive displays. Crystal palace sit joint bottom of the away table having picked up 6 points from a possible 36 away from home. They're the only side without a draw in the league on the road. Crystal Palace have been excellent under Tony Pulis who officially took charge of his first game on 30 November with Crystal Palace sitting joint bottom of the table with just 7 points. However, since his appointment Crystal Palace have accumulated more points than any other team in the Premier League having taken 16 points from a possible 21 at home in the league making Selhurst Park somewhat of a fortress. Despite popular belief, Pulis is yet to implement the sort of football that was criticised heavily at Stoke City. Everton will be without long term injuries Darron Gibson, Arouna Kone and Bryan Oviedo. Antolin Alcaraz isn't due back until the weekend whilst Romelu Lukaku still has a couple of weeks to go. 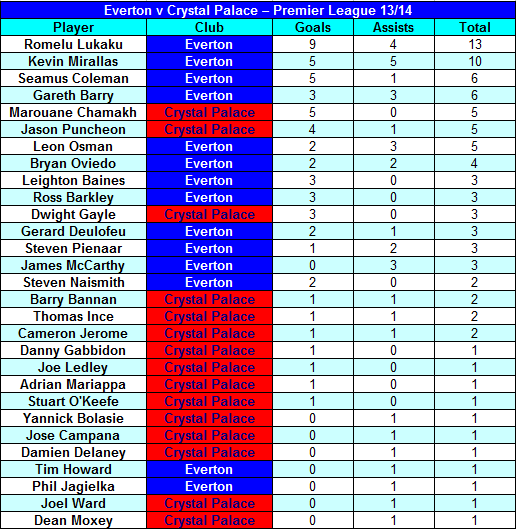 Joel Ward and Cameron Jerome are the only doubts for Crystal Palace but both should be fit. Refuse to give up on 4th yet but this is vital, think Traore is our last throw of the dice, if he hits the ground running we could still feature. Important this game is, important to bounce back with a win and to get the confidence back and take it into the swansea game which is also a big game. COYB!!!! We need a start to the game that we've not seen since Newcastle, right at them with as much pace up top as possible. Get the crowd up for it early on and get a goal then they've got to make a game of it. Our problems of late have stemmed from not getting the first goal when we are on top and it leads to a few nerves creeping in obviously, get over that hurdle and we should be on for a relatively easy night and a comfortable win. The one concern is Palace are likely to use the same sort of tactics that did for us at Anfield, sit deep, by pass midfield and look to use the pace of Ince, Puncheon and Chamakh. Although their no way as lethal its still something we need to be ready for. There's "possible" and then there's "plausible." I think this fixture could be much tougher than expected. That said, we've been a high character team all season, and I've no doubt we will show up and give it our best. Tough game this, Pulis has got them out of trouble and they're getting results, i would take a scrappy 1-0 win now. This and the lack of sustained pressure on the opponent's goal when we're on top in a game have been my biggest gripes with the season to date. Their recent home form has been very good with 5W 2D 1L, their recent away from home less so 1W 4L but defeats to Arsenal, Spurs, City and Chelsea is no suprise and non of those teams have put more than 2 past them, plus they managed an away win against Villa so this should be a tough game but you'd have to back us at home. Id be dissappointed if we dont win, not surprised tho. They will sit back all game and as has been said try to use their pace on the break. Confidence for them will be sky high. I'll take any sort of win (as I will again vs Swansea on Saturday) but at some point we're going to have to start playing well again. You don't have to play well to win but in doing so you're more likely to give yourself some breathing space either for conceding goals in that game or the ability to ease off/bring players back in etc. As it is games are very tight (well, apart from the obvious...) against everyone that we're playing at the moment. Think we played well against Norwich tbh. We havent been immense in a good while though. I thought we were ok early on and then really poor second half personally. Opinions eh!